I work with a lot of parents of picky eaters struggling to find new ways to get their kids to try a bigger variety of foods. While some babies may grow into picky kids, I do find that you can often cut back on pickiness by offering your child a variety of flavors from their very first “meal”. The first three years of a child’s life provide a great opportunity to develop lifelong healthy eating habits. You can greatly influence your child’s food preferences by teaching her to enjoy fresh new flavors right from the start. There are many baby food options on the market today that offer an incredible variety of new first foods, however I really enjoyed making my own (and supplementing with store bought when needed!). Not only did it help set up healthy habits for my kids, it also got me in the habit of making one family meal (instead of becoming a short order cook!). Another benefit is that you can put together endless combinations of foods and even try out some different mild spices (some favs include cinnamon, ginger and cumin). Baby Brezza reached out to me and asked if I would like to try out their new Food Maker. Even though my kids are no longer eating baby food (they are 6 and 8! ), I was excited to try it. I love showing new parents how simple it is to make your own baby food. The sent me the One Step Baby Food Maker Complete. This new model is more advanced than the one I had when my kids were little. You can choose from 3 settings: steam only, blend only or automatically blend after steaming. It also comes with 3 reusable food pouches with easy-fill funnels for easy filling, storing and serving and a very simple recipe/cooking guide. My 6-year old is obsessed with all things baby and could not wait to help me start making some baby food. We started out with a sweet potato apricot combination. I just peeled and diced a small sweet potato and added in 1 fresh diced apricot. After it finished steaming and blending we added in a pinch of nutmeg. Adding mild spices is a great way to expose your baby to different flavors and to help influence their food preferences. Next we tried a pear, apple, carrot combination and added some cinnamon in at the end. After each batch we set up one of the food pouches with a funnel and poured in the food. 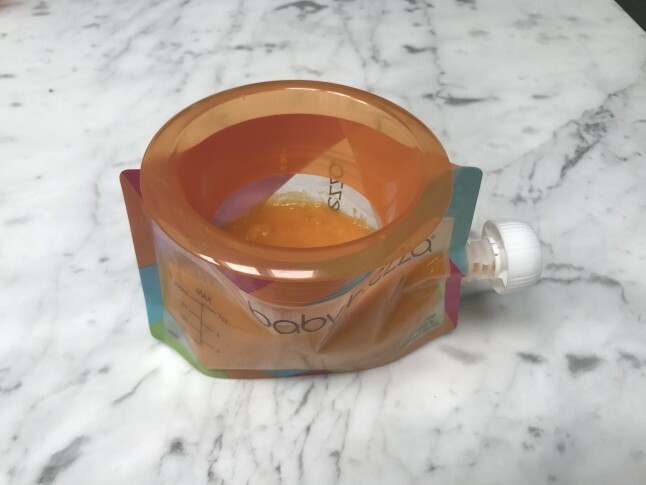 The funnel made it so easy to transfer the food to the pouches…no mess at all. I wish I had this machine when my kids were little. It really was so simple to set up and easy to use (and clean!). Definitely a great little appliance to add to any new mom’s kitchen. Starting your baby off with fresh, homemade food is the perfect way to set your entire family up for lifelong healthy habits!